An important related question is why the early primates were precocial. What are the selective contexts in which precociality seems to be favored in mammal evolution? A key here appears to be some component or components of the arboreal environment. It has been noted previously that arboreal, gliding, and flying mammals generally have small litter sizes of relatively well-developed young (Luckett, 1980; Martin, 1969). Meier (1983) demonstrated that arboreality was correlated with longer gestations, slower growth rates, smaller litter sizes, and increased encephalization among 33 species of sciurid rodents in North America. 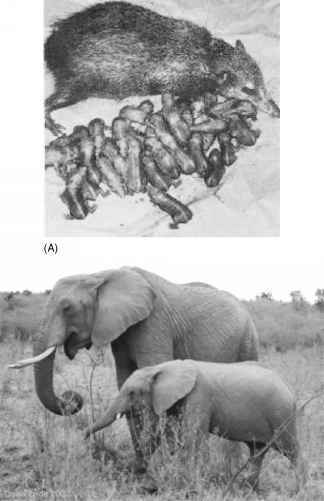 Eisenberg (1975) emphasized that the arboreal anteaters Tamandua and Cyclopes exhibit reduced litter sizes, increased longevity, and higher EQs compared to their terrestrial relatives. Eisenberg and Wilson (1981) have demonstrated a similar trend within didelphid marsupials. Further research by Rasmussen (1990; Rasmussen and Sussman, this volume) on the didelphid Caluromys explicates this pattern. In addition to various cranial and postcranial morphological adaptations possibly associated with their arboreal habitus, species of Caluromys are known to be characterized by relatively small litters, low reproductive rates, extended longevity, and relatively high EQ compared to other didelphids. Jones and MacLarnon (2001) link arboreality to reproductive strategy and encephal-ization in chiropterans. Precise relationships among the variables in this complex web of features are far from clearly established. In Meier's (1983) study of sciurids noted earlier, higher encephalization was correlated with arboreal habitus, but the arboreality was associated with not only the life history features, but also divergent locomotor and dietary habits (storage of nuts and seeds versus a terrestrial diet of grasses, etc.). This raises the issue of which of these (or other correlated but uninvestigated) variables is directly and causally associated with the relative brain size. Lemen (1980) has suggested that climbing ability and the need to navigate structurally complex environments is the key input to higher relative brain size in arboreal rodents (though he did not examine influence of or control for reproductive strategy variation). Moreover, we cannot simply assume brain size is the primary "independent" variable of selective and fitness significance. Meier (1983) in fact argues that the small relative brain size of terrestrial sciurids is possibly a correlated artifact of the rapid postnatal growth rates and larger adult body size of these species, rather than any indication for decreased levels of cognitive capacity or behavioral complexity. This accords with observations that even though large-bodied ground squirrels exhibit many life history traits of a K-selected strategy (increased longevity, smaller litters, and high sociality), they have relatively smaller brains (Armitage, 1981). The reasons for this most likely have to do with the large body size of these species and the evolution of this size differentiation via postnatal growth rates among closely related species, as I have previously discussed in a comparison of chimpanzees to gorillas and generalized to other primate and mammal groups (Shea, 1983; see also O'Shea and Reep, 1990; Riska and Atchley, 1985). I believe that the developmental basis of rapid size change may be a factor in many analyses which note a correlation between relative brain size and diet (or other ecological factors). In such cases, unusually high or low EQ values determined relative to the general class or ordinal interspecific trends would reflect spurious correlations and not specific selection on brain size per se. It is also necessary to stress that while certain aspects of the arboreal environment may indeed select for the complex of reduced litter size, precociality, and encephalization, this pattern is of course not restricted to arboreal versus terrestrial comparisons. For example, Eisenberg (1975) has shown that the same pattern holds among the many species of tenrecs, which exhibit litter size variation from over 30 in Tenrec ecaudatus to only 1 or 2 in Microgale talazaci. The latter also exhibits the greatest longevity, longest developmental time, and highest EQ of the tenrecs. The macroscelids, as noted above, are also relatively highly precocial and encephalized, yet clearly terrestrial. So what is it, specifically, about the arboreal environment that might also be found in certain other environments and select for the production of highly precocial offspring? Relatively stable and predictable levels of resource availability and competition, along with low levels of neonatal, juvenile, and adult mortality, appear to be key elements (Eisenberg, 1975; Martin, 1975b). Kappeler et al. (2003); Purvis et al. (2003), and Van Shaik and Deaner (2002) have also commented on the possible links between arboreality, reproductive strategy, and relative brain size in their discussions of primate life history evolution. Purvis et al. (2003: 38) further stress that "body size seems to be an adaptive response to life history strategies, rather than the other way around." This view may have great relevance for our understanding of early primate evolution. should be selected for, then the transition phase must be bridged from, at one extreme, a young that is helpless in a nest. In general, this has been done either by retaining a nest phase in the rearing cycle of the young or eliminating it by producing a small number (e.g., 1-2) of very precocial young which can cling to the mother. The mother thus assumes the function of a "moveable nest." Even in primates that nest or park their infants, there is always considerable maternal carriage of the offspring (Kappeler 1996, 1998). There is also frequent transport of the grasping infant on the belly or back in those species which also occasionally "mouth-carry" infants to and from nests and parking places. 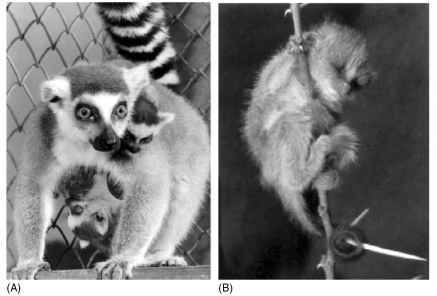 Clinging to thin branches during these "parked intervals" when they are entirely on their own may be as significant a challenge to the grasping appendages of infants as when they are holding onto the moving mother's fur (Figure 8B). As infants age and begin to move about independently, the advanced degree of physical and motor development characteristic of precocial mammals also provides a key advantage in the spatially complex arboreal environment (e.g., Pagel and Harvey, 1988). Use of the grasping hallux by the infant to cling to the moving primate mother and small branches needs to be more fully incorporated into current evolutionary scenarios focused on these key morphological adaptations in locomoting adults. While the selective challenges to infant competence in grasping and early independent movement by no means supercede those of locomotor behaviors in adults during foraging and other movements, they most certainly do antecede these. Renewed emphases on the selective contexts of infant grasping and maternal carriage also mesh with a balanced focus on postural behaviors in addition to locomotor behaviors in formulating a complete and integrated understanding of anatomical structures and adaptations (e.g., Ripley, 1967). This more balanced approach accords well with many attempts in evolutionary biology to investigate the actions of natural selection throughout the entire life history, and not merely at the adult stage.